Bagotville is a convincing example of the virtuosity of Marc-Aurèle Fortin, unrivalled colourist and passionate cyclist, known for his breathtaking views and exhilarating perspectives of Quebec landscapes. On that day, in the small Saguenay town, a powerful summer sun lit up the roofs and made the bay sparkle in a blanket of light. The distant mountainside against the cloud-dappled sky seems to echo the abundant vegetation and tall trees surrounding the church and houses, creating a choral harmony among the elements of the painting. Each house is distinguished by its angle, colour, porch, and number of shutters and windows. Two full clotheslines billow in the wind between houses that seem to fold into one another. Rising above the many chimneys is a majestic church steeple crowned with a cross, echoing another cross on the summit of the verdant mountain behind it. In the upper right-hand corner of the painting, a boat emits wisps of smoke that mingle with the clouds, inviting the contemplative gaze to lose itself in the skies above. 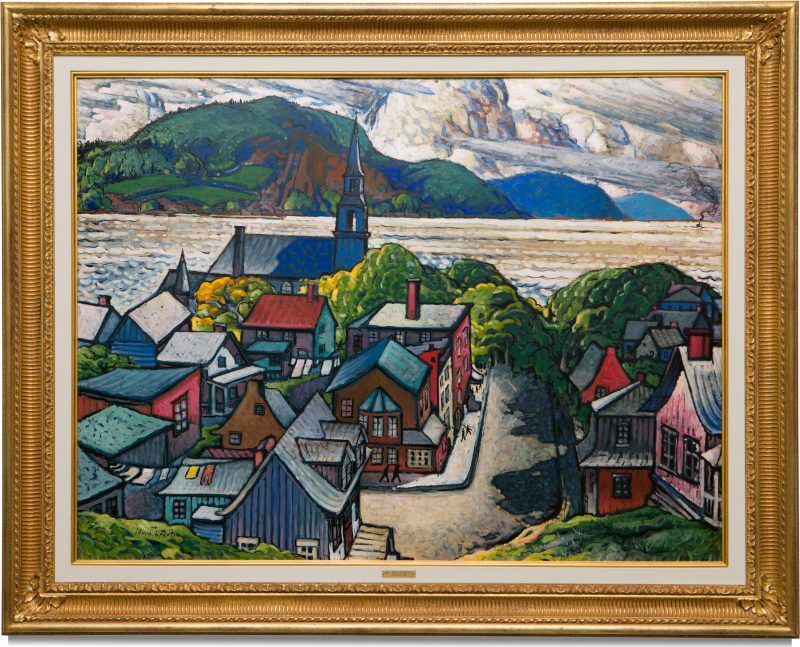 The painter’s viewpoint offers a spectacular view of the town, embracing the river and steep cliffs of the Saguenay fjord, emblematic features of this picturesque region to which Fortin returned summer after summer until the mid-1950s, when illness forced him to take a long hiatus. 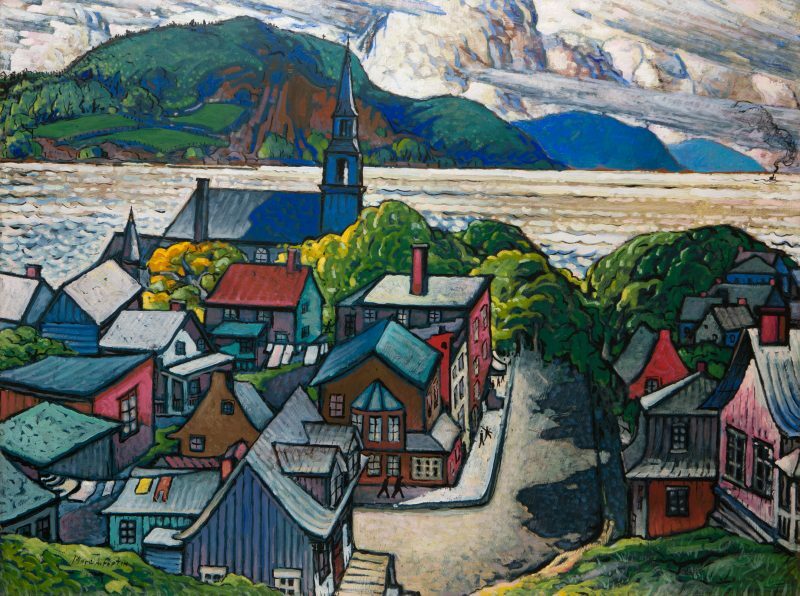 Fortin has bequeathed the public an intimate yet grandiose vision of this region, which he long explored by bicycle, painting in the open air or in his studio on an array of available supports. His immense trees, like cathedrals bathed in radiant green, red, or golden light, and his lyrical views of the Charlevoix, Saguenay, Gaspé, and Montreal regions always amazed his peers. It is therefore unsurprising that much has been written about Fortin’s prolific body of work that portrays his beloved Quebec landscapes. The painter’s mystique and reclusive lifestyle have also inspired many authors, especially as he remained on the fringe of modernist tendencies, preferring to explore his own personal style and distinctive touch. A true master, Fortin forged a unique and enviable position for himself among the greats of post-war landscape painting. Marc-Aurèle Fortin was born in 1888 in Sainte-Rose, on the outskirts of Montreal. He spent his childhood in the shade of imperial elm trees, which would become a preferred subject from 1920 to 1930 and also brought him renown. In 1939, he participated in the New York World Fair, where he was awarded the bronze medal for his painting March Snow, and in 1942, he was elected an associate member of the Royal Canadian Academy. 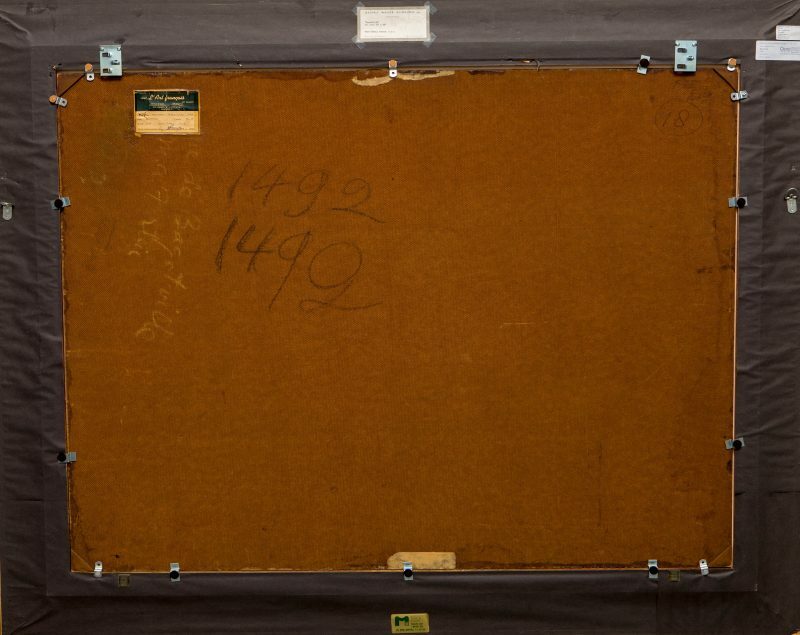 His work was the subject of several retrospectives during his lifetime, including an exhibition in 1944 at the National Gallery of Canada that travelled to Montreal and Quebec City. Fortin died in 1970 at Sanatorium de Macamic in Abitibi, blind and with both legs amputated. BUISSON, René. Marc-Aurèle Fortin, un maître inconnu, Montréal, Musée Marc-Aurèle Fortin, 1975. ROBERT, Guy. Marc-Aurèle Fortin : l’homme à l’oeuvre, Ottawa, Stanké, 1976. GRANDBOIS, Michèle (dir.). Marc-Aurèle Fortin : l’expérience de la couleur, Québec, Musée national des beaux-arts du Québec ; Montréal, Éditions de l’Homme, 2011. OEuvre reproduite à la page 47 / Work reproduced on page 47. Registration for the auction of November 6th will begin soon. We invite you to leave your contact information so we can send you the details of the sale at the time of opening. Subscribe to receive the next auction catalog.